Invasive Aquatic Plants are a serious threat to Maine's waters. With no natural enemies, these plants can spread rapidly, choking out native plants. This process can have a negative effect on water quality. 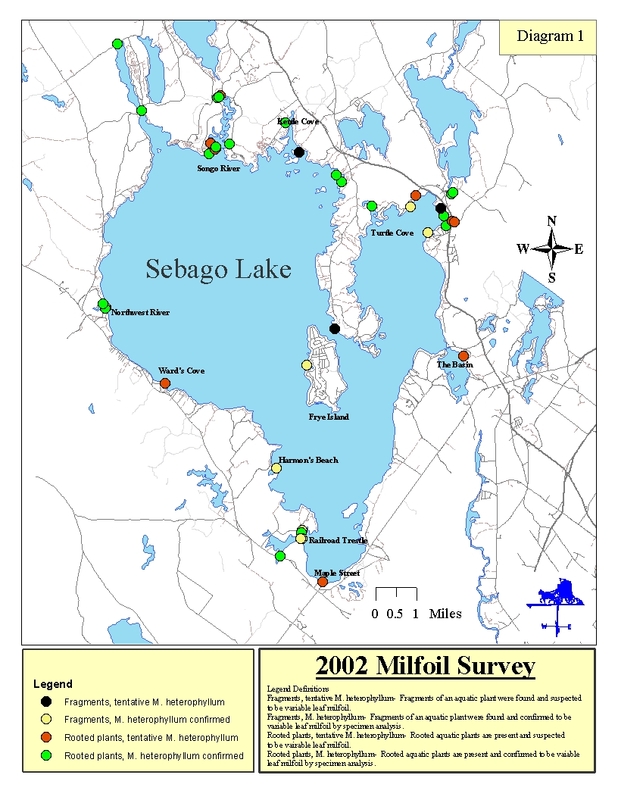 That is why the Portland Water District has led the preventative efforts against these deadly plants entering and harming Sebago Lake. To learn more, view the resources below. For more information, visit these web sites. Aquatic vegetation may appear to be a nuisance to some lake users, however; aquatic plants are extremely important to the lake's maintenance and stability. Not only do plants add beauty, but they act as a soil stabilizer, trapping sediment from erosion and causing particles to settle near the shore. Plants found in shallow water protect shores from erosion by lessening wave action. Aquatic plants provide nesting materials and shelter for various species of birds and fish. Weed beds provide camouflage and protection and are very important nursery areas for game fish. Most importantly, plants provide a diverse food source for the lake's ecosystem. Submerged plant leaves and stems provide an ideal surface for the growth of microscopic attached plants called periphyton. These tiny plants are grazed by small crustaceans and insects which in turn are an important food source for fish. Grasses such as wild rice are eaten by song birds and waterfowl. Aquatic plants are also eaten by deer, moose, beaver, muskrat and porcupines. If you must get rid of the plants, you need a permit from the Department of Environmental Protection. Then you may clear a small area in front of your camp by raking, pulling or cutting the plants by hand. Usually, boating and swimming activities will keep your area clear of plants. If you notice a sudden growth in plants in front of your camp, it could be due to a failing septic system, an increase in soil erosion or the creation of a protected area after construction of a pier or breakwater. Ducks are a host organism for a type of parasitic worm that causes "swimmers itch." In brief, the parasite passes from the duck to a snail and then becomes free swimming, searching for another host to live in. When the parasite encounters bathers, it penetrates the skin. Full penetration occurs after the bather emerges from the water. This is associated with a prickling sensation. People affected by "swimmers itch" may experience red spots or bumps up to 1/4 inch in diameter and irritation of the skin. Some may have little or no reaction or severe swelling, pain and fever. Swelling usually dissipates within a week although redness may take longer to disappear. Because full penetration does not occur until leaving the water, the easiest method to prevent excessive skin irritation is to rub your body with a coarse towel before drying off completely. This crushes the organism before it has gone completely through the skin. A shower immediately after emerging from the water is also helpful. Please resist the temptation to feed the wild ducks. These animals become very tame and lose their instinct to migrate in the fall, facing death from freezing. Also, tame ducks are no match for duck hunters during hunting season. From early June through early July, dust may be pollen from nearby pine trees. The pollen might look similar to algae, but pollen is yellow-green and dust-like and floats mainly on the surface. Eventually the pollen will become water logged and sink out of sight. An algal bloom is green to blue-green in color and may be soupy in appearance. Algae are tiny microscopic plants that are natural components of lakes. An algal bloom occurs in a lake with high nutrient concentrations - when one species of algae competes successfully with the other algae present and becomes so abundant that the water becomes murky. Most blooms in Maine are either made up of diatoms or blue-green algae. Diatom blooms usually occur in the late spring or early summer and are less objectionable than blue green blooms. Diatoms turn the water a bright green or brown, but do not create the same kind of odors associated with blue-green algal blooms. Blue-green algal blooms create a greater problem for lake users because they are subject to concentration by wind and to scum formation at the surface of the lake and at the shoreline. When these algae die and decompose, the resulting odor can be very unpleasant.